I came across this idea a few weeks ago and thought it was brilliant! Here’s a solution to your CH cat unintentionally stepping in and tipping her food and/or water bowl. Simply place the bowl in the middle of a travel pillow. The travel pillow will make the bowl a bit sturdier; it will also surround your cat’s bowl with a soft surface — just in case she accidentally falls into it. While I can’t guarantee that it’ll stop your cat from tipping her dish, it very well may help in most situations! If you’re using the travel pillow with a water dish, here’s another idea: Wrap the travel pillow in a plastic newspaper bag or a garbage bag that you can cut and tape so it fits properly. This will prevent a wet pillow from sitting on your floor all day (another reason to put the water dish on a mat of some sort); granted you can always throw the wet pillow into the dryer, too. Have you used this idea or have you tried something similar? Please share in the comments! That’s a nifty idea. I may try it in conjunction with my current solution. What I do now is put a water dish inside a casserole dish with a towel between them. The towel soaks up the spilled water and the casserole contains the wet towel and any water that might not soak up. This keeps 95% of the water off the wood floors but I admit, it’s not a soft landing if Weaver wobbles into the bowls (or is pushed or stunned there by his big-bully-brother Buford). Thanks!! That’s a great idea too! I place trays under their dishes (ones that have lips, in case of a spill), which help, but they certainly don’t prevent the bowls being spilled over. Perhaps when we combine ALL of our ideas! brilliant idea! 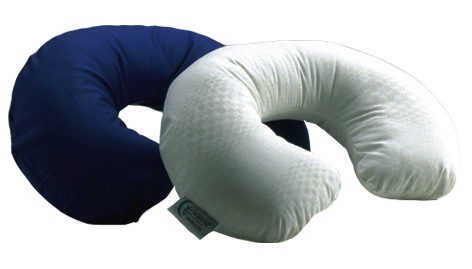 how about using an inflatable travel pillow which is usually wipe-clean and water resistant and can moreover be filled more, or less, to accomodate different sizes of bowls and different levels of support needed? they are usually sturdy enough to resist claws. What a great idea! Thanks for sharing, Sarah!